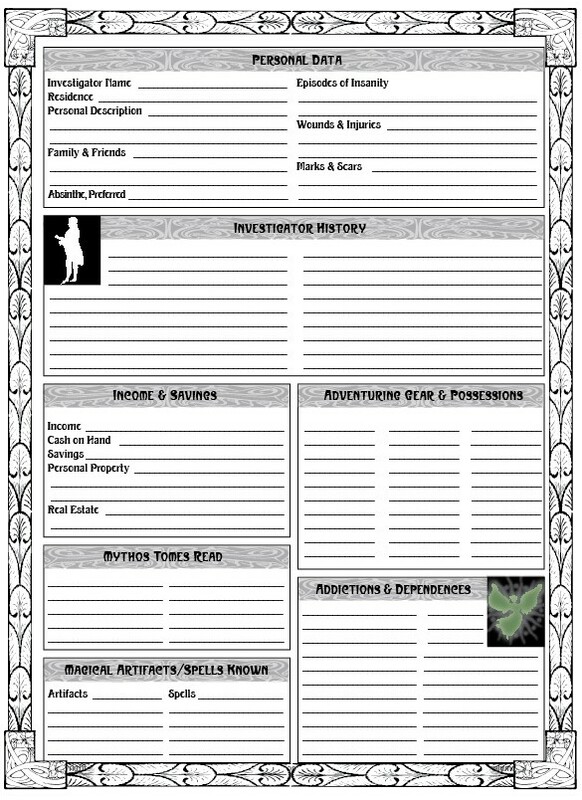 Originally I started designing custom Call of Cthulhu character sheets for a specific PDF scenario I was designing (still in the works). That adventure called for 1890s Investigators who were more of the artistic and bohemian bent than the pipe-puffing detective bent. 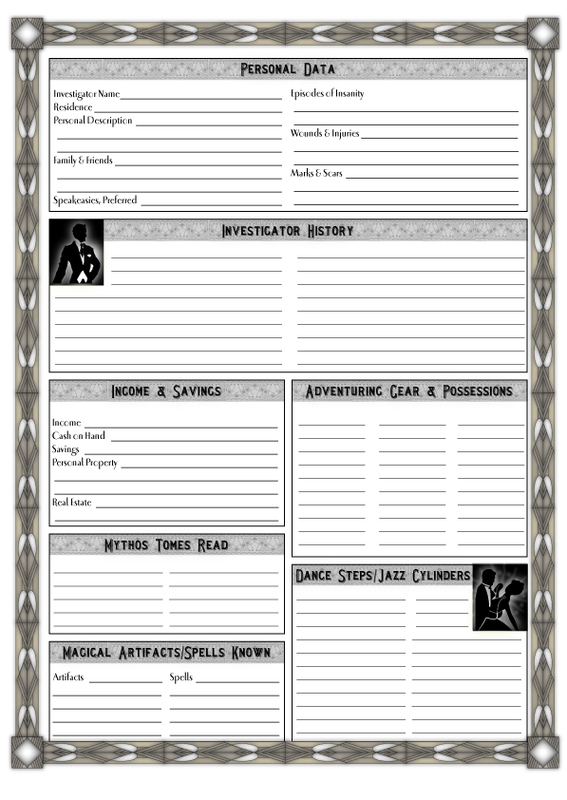 I figured the normal Chaosium sheet wouldn’t really do justice to those kinds of Gaslight-era characters, so I made a new one. 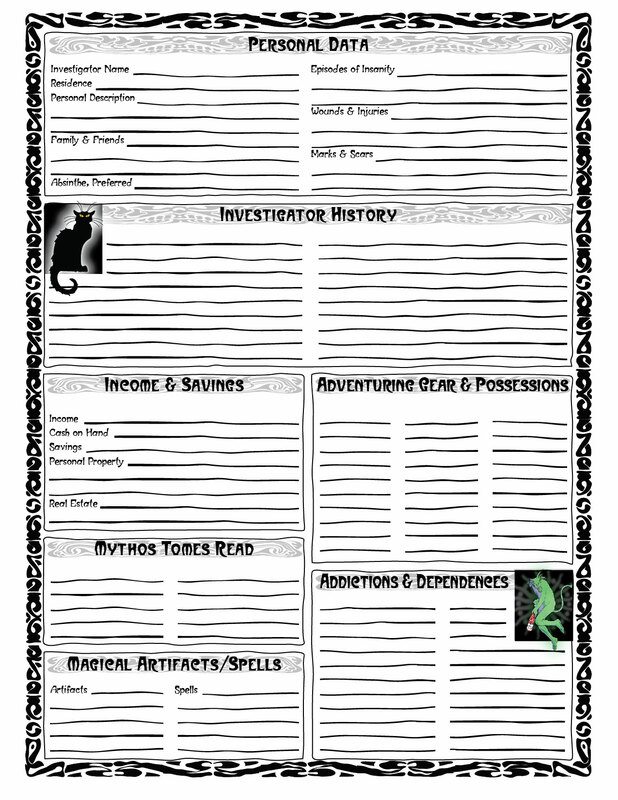 After sharing that design online, and receiving some positive feedback, I decided to do further custom Cthulhu sheets. These designs are probably the things that have garnered the most attention, of all the things I have published on Cthulhu Reborn, and have been responsible for my inclusion in a number of professional publications (notably, Miskatonic River Press’ Lux in Tenebras, and several upcoming books). 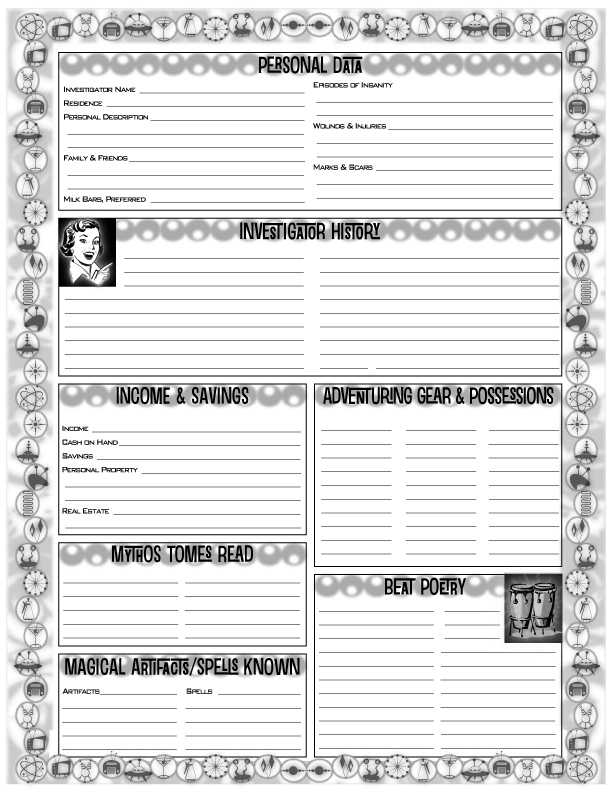 This is my take on the 1890s character sheet, influenced strongly by the Art Nouveau movement. 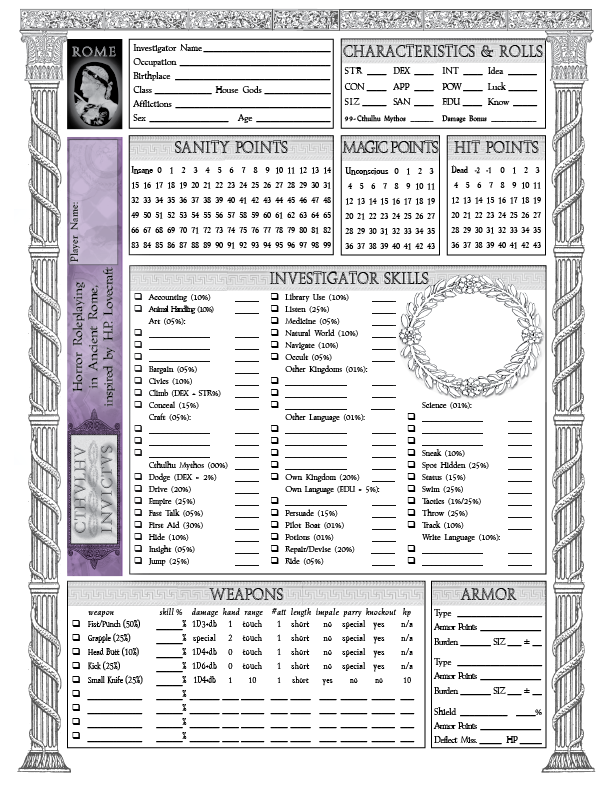 This sheet is included in the new (3rd) edition of Chaosium’s “Gaslight” setting. The 1920s is the “default” era for Call of Cthulhu, and still the most commonly played. This sheet design aims to capture an Art Deco feel. I read online that Chaosium has plans to publish a book of Call of Cthulhu scenarios (and source material) set in the 1950s — the so-called Atomic Age. 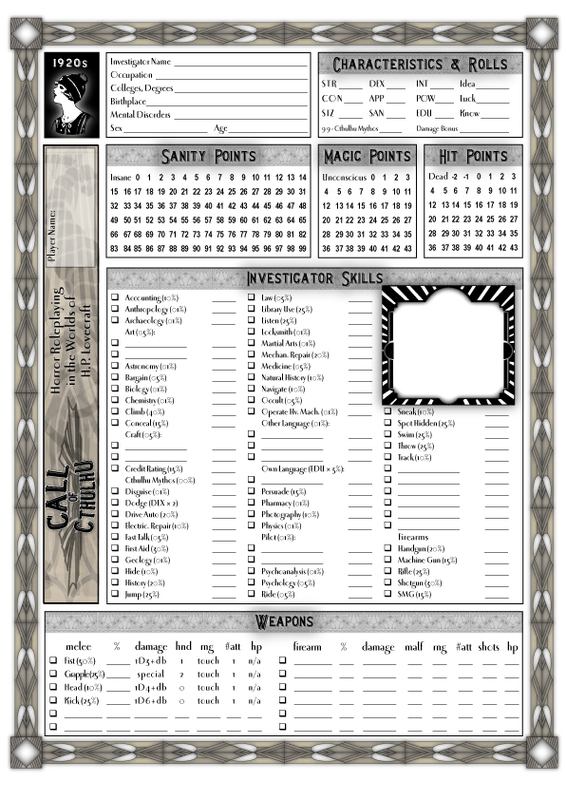 I thought it would be interesting to see what I could do by way of a 1950s character sheet layout … evidently someone at Chaosium spotted it: now it looks like (a variant of this) will be the “official” Atomic Age character sheet published in the book. 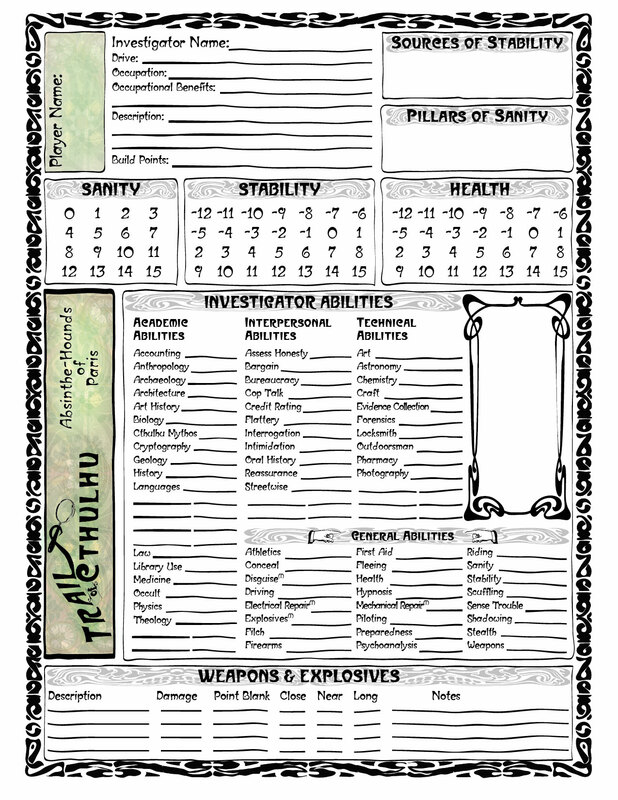 Based on the designs I had published online, I was invited by Miskatonic River Press (fantastic guys, BTW) to design a character sheet for an upcoming Cthulhu Invictus publication they had planned. This turned into the PDF-only book “Lux in Tenebras”. 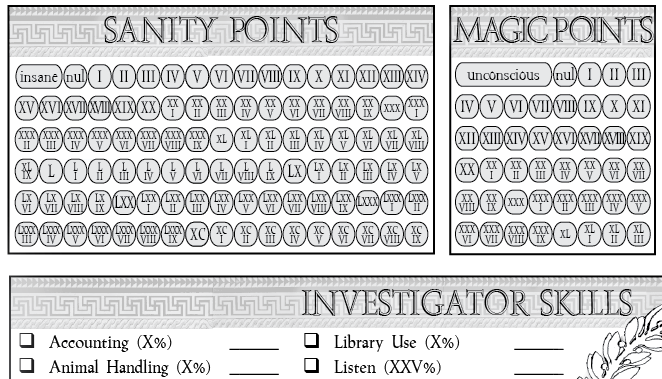 Somewhere during the design process, I had a crazy idea that it would be cool if the Character Sheet used Roman Numerals exclusively. Now, most people these days don’t find these too easy to read, but I guess it gives a kind of Roman flavour … and it’s wonderful punishment for a Keeper to inflict on his/her players. Here’s a snippet of what the Roman Numeral version of the sheet looks like. 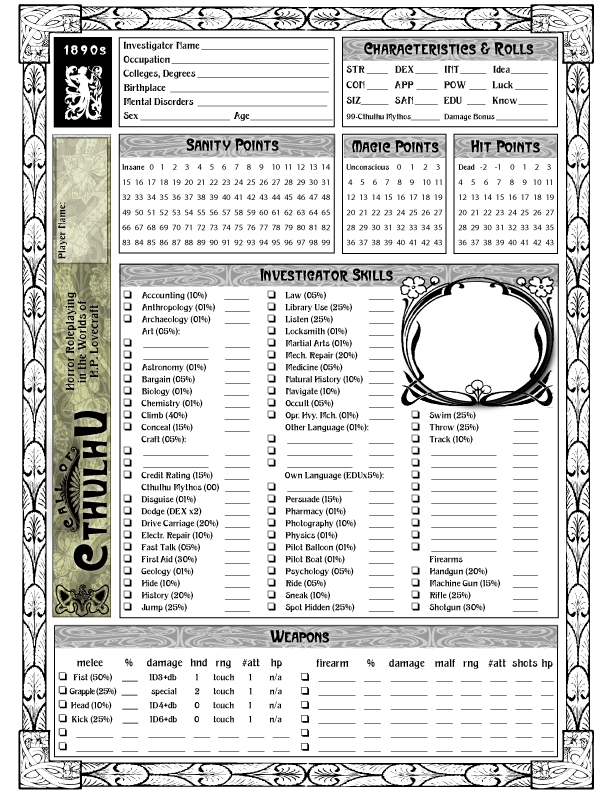 I was commissioned by someone who runs a very unusual game of Trail of Cthulhu set in 1890s Paris, to design a custom version of the Trail sheet in an Art Nouveau style. 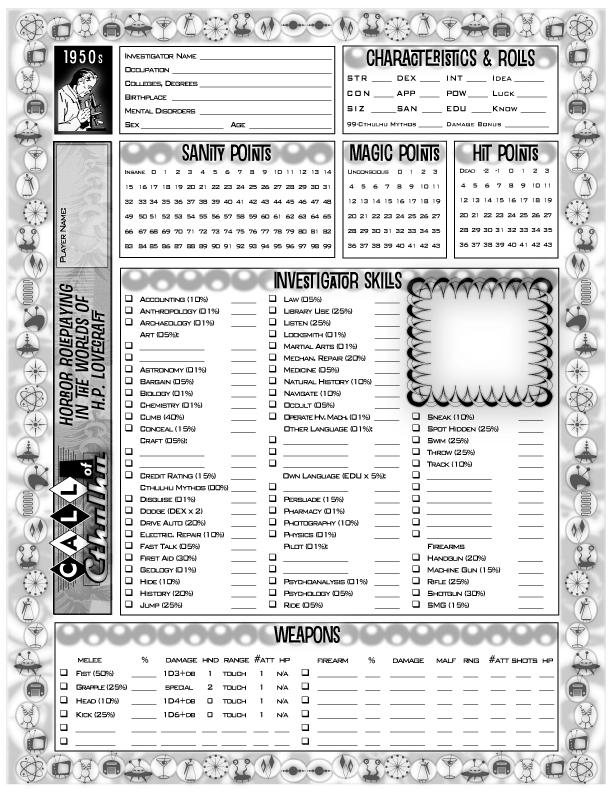 This sheet borrows slightly from the CoC Gaslight sheet, but tries to capture a more hand-drawn poster look. 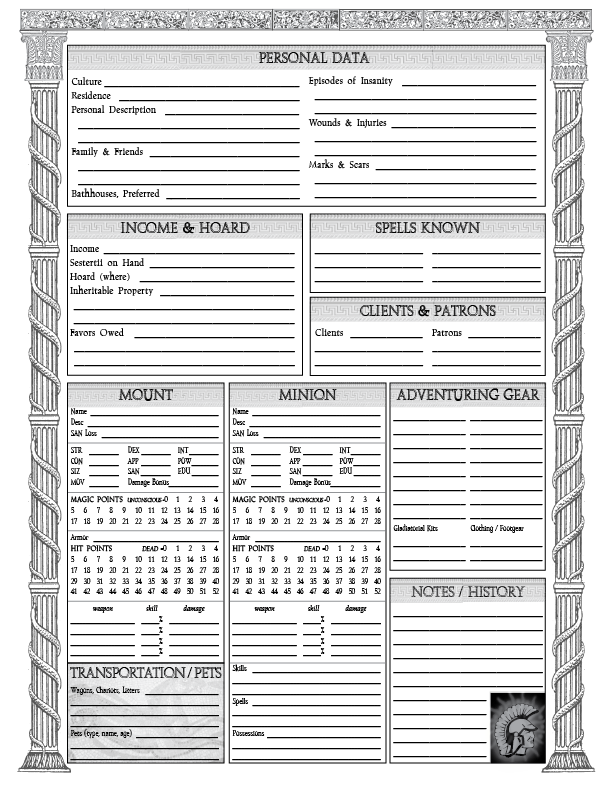 How do you insert a picture of your character in the Rome Sheet? Generally it is possible (if not exactly easy or intuitive) to add custom images to a PDF as a type of comment/annotation. The “trick” is to use the Stamp tool in the comments menu. This tool has an option where you can create a custom stamp from either a PDF on disk or from the image currently in the clipboard. Once you’ve made a stamp you can put it anywhere on the PDF you like, move it, resize it etc. Check out this page on Adobe’s site for some info.